The Scientific American Flying Machine Trophy. 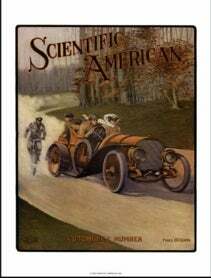 In presenting this trophy to the Aero Club of America the publishers of the SCIENTIFIC AMERICAN have recognized that the conquest of the air may not come through dirigible gas bags, but through the perfection of aeroplanes, machines which are heavier than air. The cup is offered for competition among the heavier-than-air machines and, year by year, as aeroplanes are developed, the conditions governing the contest will be readjusted. The cup stands 32 inches high and is a magnificent trophy of wrought silver mounted on a pedestal of onyx. At the base of the pedestal-shaft, graceful winged silver horses spring forth ridden by figures bearing olive branches. The shaft is surmounted by a whirlwind bearing a globe representing the firmament. On one side of the globe is the American continent, while on the other an aeroplane soars through the clouds, challenging the swallows in their flight. The whole is crowned by an American eagle, bearing a wreath of victory. The cup is of American manufacture and is valued at $2,500. The Gordon Bennett International Cup. The Gordon Bennett cup was offered in 1906 as an international trophy for long-distance balloon racl's. At the initial contest one American balloon piloted by Lieut. Lahm was entered, and bore off the coveted trophy against fifteen competitors. The cup is a fine example of the silversmith's art and was modeled in accordance with suggestions made by the donor. The design represents a dirigible balloon, supported by clouds, and led in its course by a winged figure bearing in one hand the torch of science, and in the other a wreath of victory. On the body of the dirigible balloon, on one side, spherical balloons are shown high in the air and an aeroplane begins its flight. On the other side are shown a parachute and two Montgolfier balloons. The cup was constructed in Paris at a cost of $2,500. The Lahm Aeronautic Cup. On the receipt of news that Lieut. Lahm was bringing the Gordon Bennett trophy to America, the Aero Club of America decided to commemorate the victory by offering a cup for distance contests. As the Sci-ENTIFIC AMERICAN and the Gordon Bennett trophies suggest aeroplanes and dirigible balloons respectively, so this one honors the spherical gas-bag, the lineal descendant of Montgolfier's balloons. This feature is 1\ faithful reproduction of a balloon, supported lightly by the wing tips of two female figures whose out stretched hands hold wreaths of victory. The lower limbs of the figures blend into the outstretched wings of supporting eagles, perched on small spheres rising from a firmament of stars and planets. Below Is a portion of the northern hemisphere, which rests on an ebony base set with silver plates to bear the names of the winners of the trophy. The cup was made in New York at a eost of $1,500. Tbe Prevention of Fire at Sea. The recent alarming fire on the steamer "Fortunat-us" shows again the insufficiency of the methods adopted on most vessels to protect themselves against such an outbreak. A good 'fire appliance has not only before it the task of subduing a fire, but specially of saving the cargo from being damaged by water. In many cases after the fire has been finally extinguished, it has been found that the water damage far exceeded the damage by fire. It is therefore obvious that an ideal fire appliance can only be of a purely chemical nature. It is not only the prevention of water damage which tells so much in favor of the use on board ship of a chemical fire protection. There is another reason, well known and feared in shipping circle, viz, that a fire cannot always be extinguished in cer tain goods, especially in cotton bales. Such a cargo is not only easily combustible, but a fire in it cannot readily be checked, the water acting, as it were, as a source of oxygen. A gas, moreover, permeates all the small channels of woolen fibers which water is unable to reach. Similarly, water cannot extinguish a fire on an oil steamer, although it is easy work for a chemical fire appliance to do so. Among the chemical fire appliances now in use at sea may be mentioned that known as the "Gronwald" system. It consists, briefly stated, of an apparatus through which carbonic acid gas is passed into perforated pipes, which are so fixed in the hold as to allow a good distribution of the gas. The gas is carried in the ordinary steel cylinders that are used for refrigerating plants on board vessels," the numbjr of the cylinders depending on the size of the ship. From the steel cylinders the gas passes into the apparatus, where it expands before entering the pipe system in the compartments. To facilitate the flov-of the gas, steam from the ship's boilers is let through a special arrangement of the apparatus. Each hold can be worked independently, the apparatus recommended for ordinary steamers and sailing ships of any size being portable. For its operation no machinery is required, the gas working under its own pressure. The steam passing through the apparatus Is merely for the purpose of heating the latter to aid in the expansion and flow of the CO, gas, and to prevent the formation of snow. The "Gronwald" system is not a gas-generating pLant requiring special skill for its operation. The gas is always ready for instant use, and this is obviously a very important point. The "Gronwald" CO, system is, above all, adapted for the prevention of spontaneous combustion and ignition. As soon as the air in a hold reaches an abnormally high temperature several bottles of liquid CO, can be discharged into the hold in order to displace the air from it, so cutting off the supply of oxygen, the source of every outbreak of fire. At the same time the liquid CO,, which has been so far in a liquid state, will evaporate rapidly and deprive the surroundings of its heat, thus lowering the temperature in the hold by 30 deg. and more—a point in its favor which, it is stated, no chemical fire appliance except the CO, system can claim. Another virtue of the CO, gas is that it is a thoroughly neutral gas. It does not affect the most delicate cargoes, as those of silk, tobacco, and wine. This is contrary to the action of most other chemicals, which damage many such cargoes and also the fittings of the ship if they happen to be wet or moist. The last state of that ship may be worse than the first under such conditions. For fire extinguishing purposes it is not necessary absolutely to fill up the hold with CO, gas, but the admixture of a certain percentage of gas to the oxygen in the space is quite sufficient, this depending on the nature of the burning goods, and ranging from 10 to 25 per cent. Taking as the outside limit an admixture of 25 per cent, the "Gronwald" appliances are able to fill with even so high a percentage as 25 per cent in about one hour's time a space of 67,200 cubic feet, which means the contents of 48 steel cylinders of 40 pounds liquid CO, each. According to the size of the ship, a number of 50 to 70 cylinders of CO, is a very fair supply for fire protection. Vessels having refrigerating installations can, of course. combine the use of the cylinders both for refrigerating and fire appliances, if provided with an ample stock. The Japanese government intends to spend $75.000.000 during the next five years on railway construction and equiiiment. Among other items, appropriations are made for doubling 830 miles of track, and for constructing 900 locomotives, 1,000 passenger cars, and 19,000 freight cars. This is made by taking an ordinary one-pc standard clincher rim, and cutting it into two equal parts by removing about a quarter of an inch from the center of the rim all the way around. The inside half is securely fastened to a plain steel band upon the felloe of the wheel. 'The outside or removable half of the rim slips over this band, and is drawn toward the permanent half by a stiff ring which is drawn up by ordinary bolts through the felloe of the wheel. In this manner the width of the clincher rim may be slightly varied, and the edges of the clincher tire may be drawn closer together than the standard clincher measurement, or be left slightly farther apart. This variation in the width of the tire is so small as to cause no injury to the tire, and yet it is sufficient to take up the stretch in the casing and to afford any requir. -1 degree of inflation. This principle of Inflating a tire by drawing the casing tightly about a filled inner tube is entirely new, and applications have been made for patents in the United States and all foreign countries. Air under pressure in a tire expands and contracts according to the temperature, and an air-inflated tire is therefore subjected to a constantly varying pressure, and consequently to a constantly varying wear; while a tire inflated with an elastic solid material is always subjected to a constant pressure from with-for the reason that the filler expands and contracts in substantially the same ratio as the rubber itself. A tire thus inflated is never rim cut, owing to flat running, and the automobile owner can obtain from his tires an amount of wear which is as constant as that which he will receive from a suit of clothes. This affords a very great saving, but the greatest advantage of all is that tires filled with the new substance are no more affected by punctures than is a pin cushion by the pins that are stuck into it; even punctures from bolts or railway spikes will not ordinarily let the filler escape. When a really large and serious cut or break occurs in the casing, a tire bandage or gaiter will repair the damage sufficiently for the journey to be completed, and, in many cases, a tire will run hundreds of miles with such a temporary repair. Tires so inflated ride just as smoothly as tires inflated with air at the same pressure, and it is impossible even for an expert to tell from the outside of a tire whether it is inflated with this substance or with air.